Earlier this year Sony decided to drop BeIn sports from Playstation Vue thus bringing my viewing of WSBK and MotoGp to an end, for now. In the process they also removed all recorded races from the cloud dvr so I couldn't even watch the ones I'd recorded. Boo! So, one night I'm fixing dinner for the family and nothing of interest is on TV so I look at recorded shows and within my "Motorcycle Racing" folder is some AMA Pro Flat Track races. It's motorcycle racing so I pop it on to run in the background while I attend to my various tasks. I start fast forwarding to get past all the pre race talking so I can see the actual racing. As I'm zipping through I see a quick screen of an interview with one of the lady racers. I go back because she looks familiar, like a girl I knew who did amature road racing that I helped her set up her website. Figured maybe she made the jump. Nope. she was tall and this girl is short and her name wasn't Shayna Texter. Still, I watch a minute or so of the interview and then zip forward to the races. Now is when my jaw hits the floor. I'm always one to cheer on the women who jump in and compete with the men but most times they are usually a mid pack run. Not Shayna, she whoops all the boys on the track. Over the next few weeks I catch a few other races and her win that I saw wasn't a fluke, she's on the podium, if not the top of the podium pretty consistently. 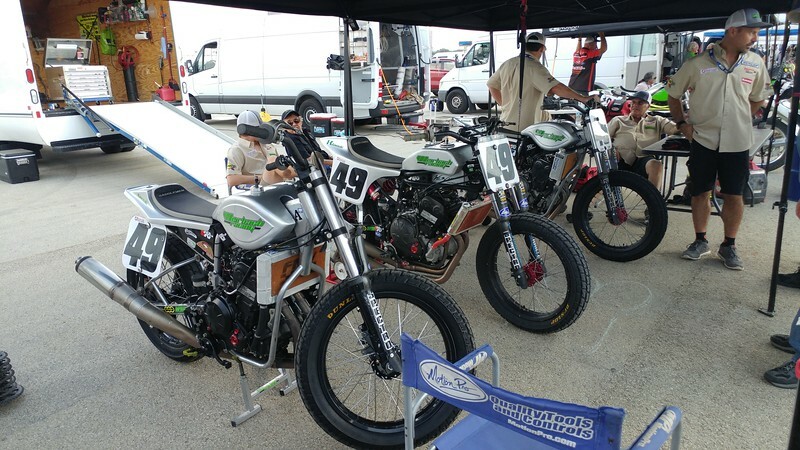 I still don't completely understand all this flat track stuff but my interest is piqued. 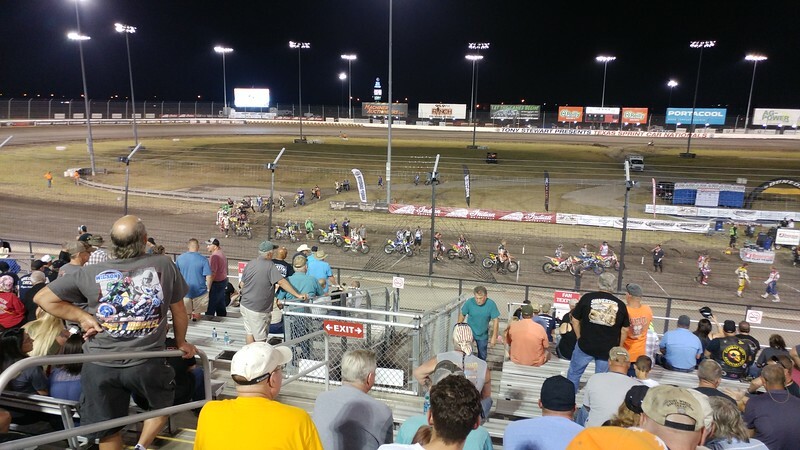 I wonder if there's any flat track racing happening near me in Dallas Texas anytime in the next year so I can check this out in person. Holee crap, they are coming to TMS in September. I pencil this in on the schedule with the family calendar moderator (my wife) and make plans to attend. About a week or so later a guy on Two Wheeled Texans put up his reserved seat ticket up for grabs for free, with the only stipulation being that it go to someone who has never been before, and that they have to write up about the experience. I can totally qualify for both of those and he was kind enough to forward me the ticket. Saturday comes around and I know I have to be there about sixish for the races. This works well because son has a soccer game at noon and wife has a training class to attend for work in the morning. 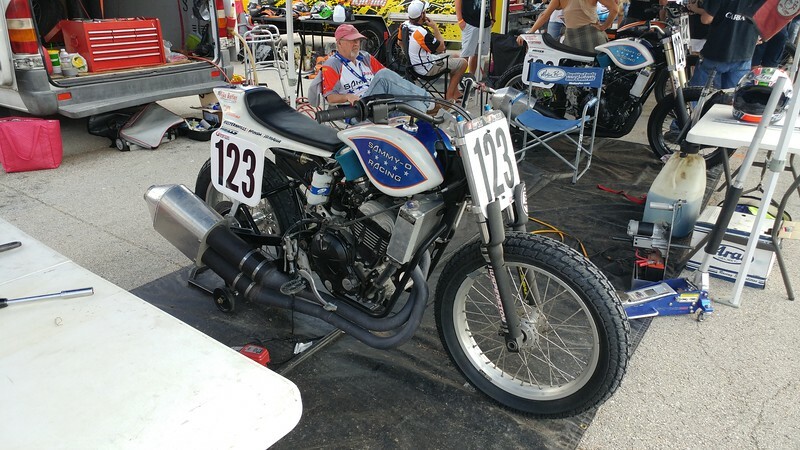 As I'm sitting around the house at 2:00PM I finally find the schedule of events and see the pits open prior to the races so I get ready and hop on the FJR to ride across DFW in the 97F heat. One stop right before so I can buy me a reasonably priced gatorade to slug down before going through the gates and I'm there. I make my way through various Harley Davidson displays and out and around to the back of the track to the pits. The pits resemble something slightly larger and slightly more organized than a motorycle track day. 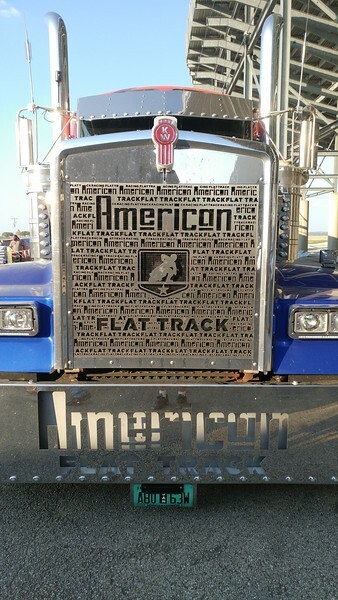 Not very many manufacturer semi trucks but a whole lot of vans, trailers and easy ups. Clearly not as much money being thrown at this event and really comes down to folks who just want to race and love it. Riders have tables set up and are signing pictures and handing them out. All of them are very approachable and chatting with their fans. I don't really collect autographs, and have no idea who they are, and also never know what to say to these folks other than "Um, yea, uh, that's a nice bike" I start taking pictures of bikes, because I love bikes and want to look them over later. I don't know whose bikes I'm taking pictures of so I'm taking them all figuring I'll maybe know a few names by the end of the day. As I'm making my way down I spot my target. Shayna's booth. Holy crap, apparently I'm not the only fan, she's got the longest line I can see out here, so I get in line and wait. A few minutes later she agrees to let me take a selfie with her and she hands me her autograph and I'm on my way. Goodness she's cute, and as someone who has been teased about being short all my life, she's short even for me. I take a few pictures of her CRF so I can show them to my CRF riding son later. Don't mid the ugly guy in the picture, she's way better looking than I am. 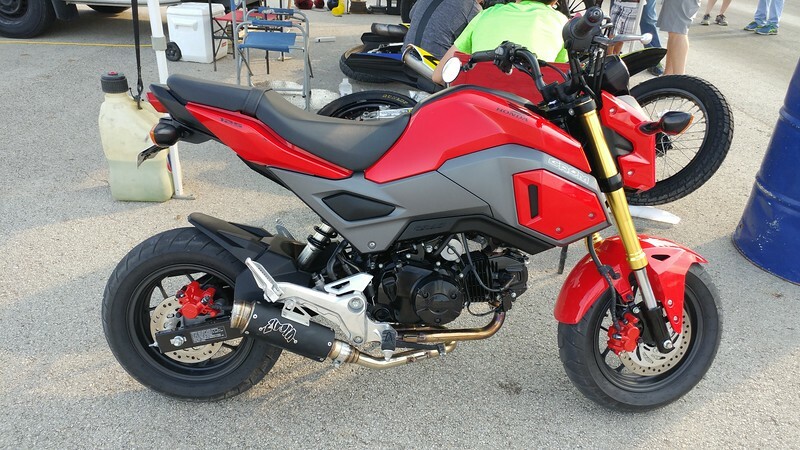 Lots of grom and Z125 pit bikes too. 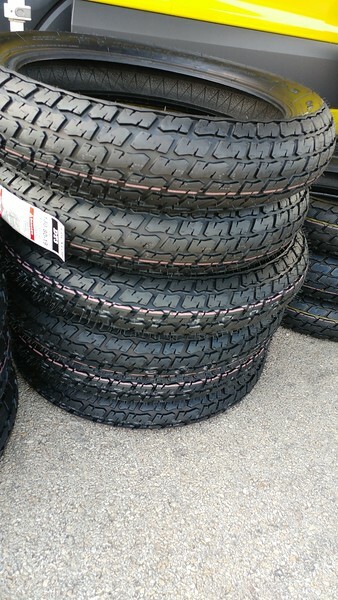 And every motorcyclist loves a good pile of tires. 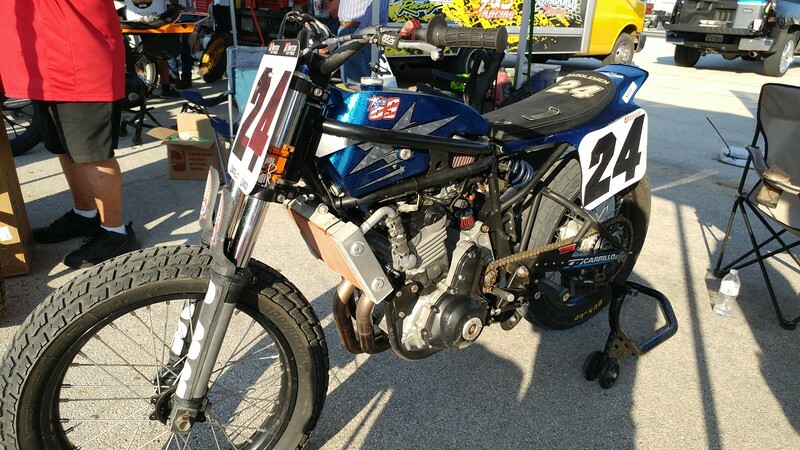 Now, as a road racing fan, I've been through the pits on various occasions and I have to say that at Flat Track racing, the manufacturer representation is quite the opposite of what I'm used to. Harley Davidson and Indian are the predominant manufacturers. In fact, they appear to be the only Factory racing teams here at all. I had grabbed my Yamaha hat on the way out the door and was wearing it while walking the pits. Nearly every guy racing a Yamaha noticed my hat and would call out to me. Kind of freaked me out a bit, but I chatted with one of the guys. Even a Harley Davidson sponsored Yamaha. Now I've seen it all. 750 Twins class is mostly Harley and Indian. 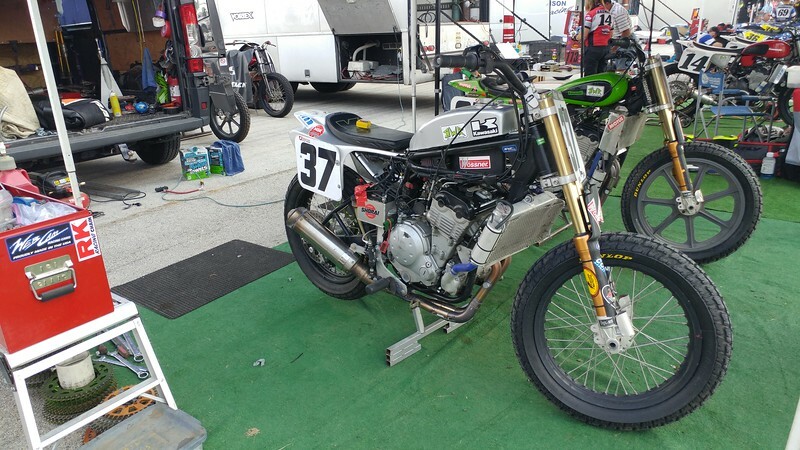 I had to go look things up later but apparently while road racing tends toward the SV650 finding the Ninja 650 not as suited to the event, flat track loves those Ninja 650 engines. There's a bunch of them out there. Reasearch shows you can buy two Ninja engines for the price of an HD racing crank, so I can see the popularity. There's also a lone Yamaha DT-07 there as well. 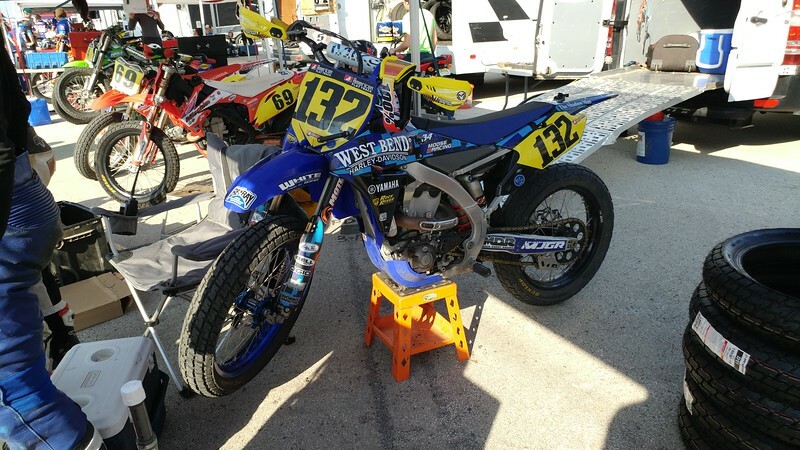 The 450 single class is composed of 450cc dirt bikes. It seems that Honda is the bike of choice with a bunch of them. There's a handful of Kawasaki's and Yamahas, hence the excitement from the few racers to spot my hat. 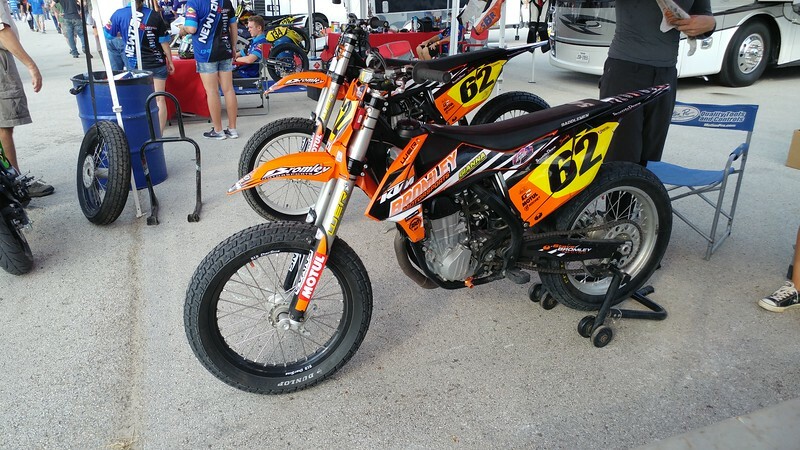 There's two KTM's, a lonely Husqvarna and oddly, zero Suzukis. I walk the pits twice looking for some but can't find any. Having a large manufacturer with zero representation is very odd to me for sure. 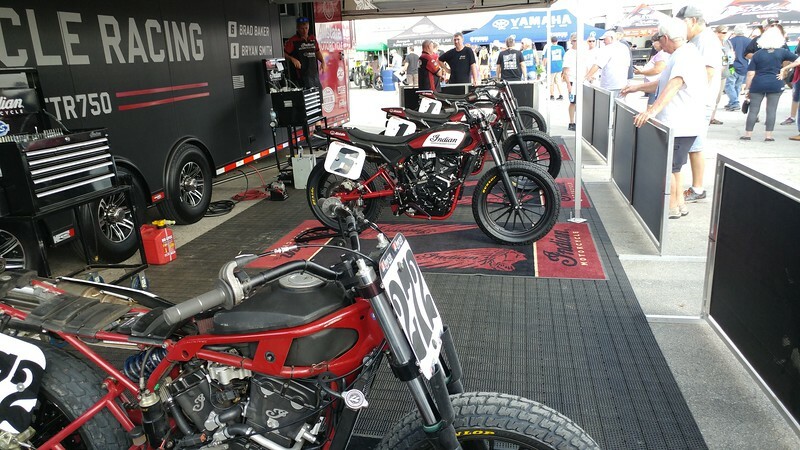 The Yamaha guy I chatted with said they just aren't fast enough by comparison on Flat Track racing. Maybe there's something to it. 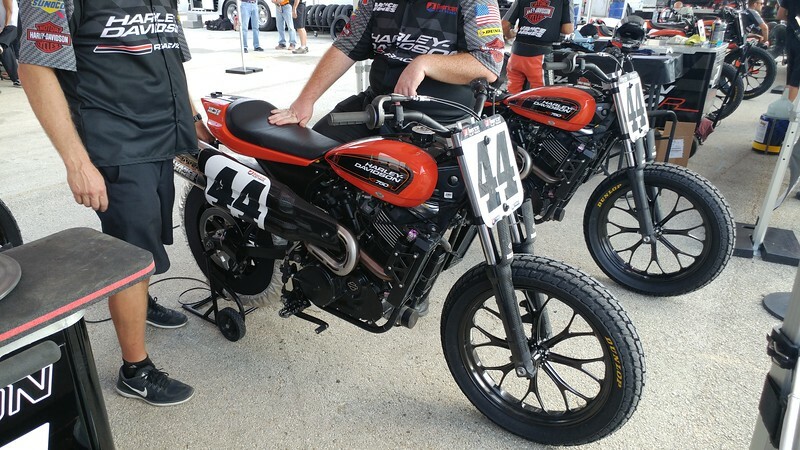 Certainly flat track performance isn't important to anyone but HD and Indian out here anyway, with the big four concentrating on other racing. 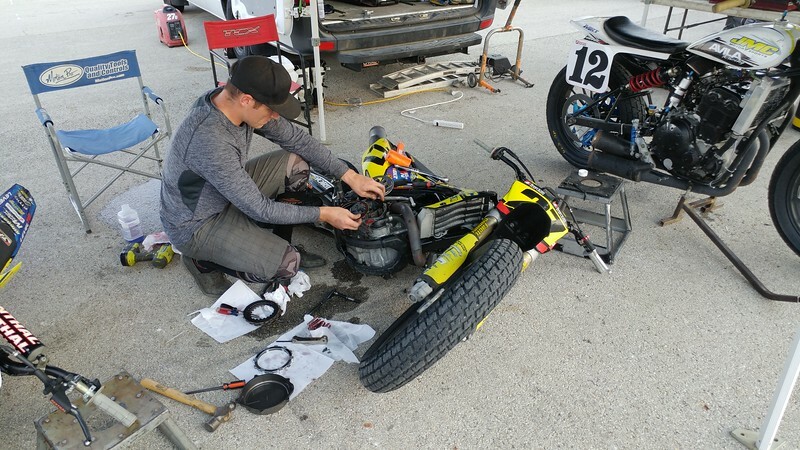 Nothing like a privateer last minute clutch change in the pits with privateer equipment. I go find the location of my seat and then head to the concession stand to be ripped off. I almost cave on a corn dog till I see the one the lady in front of me gets. $5 for a 4 inch corn dog. No thanks. I get a $5 32oz Lemonade and enjoy it a ton in the heat. The cup and ice afford me free refills of water without having to wait in the long lines again. The dash for cash six rider race at the beginning was interesting. One guy lost a chain when coming out onto the track and he had to run back and get it off the track and then head for the pits missing the money race. There were some other pre-race activities but soon enough the heat races started. They struggled with the track conditions trying to get it ready after qualifying earlier in the day, but it was apparently still wet and kind of slippery to the riders. Coming out of turn four in front of the stands the bikes looked like bucking broncos. 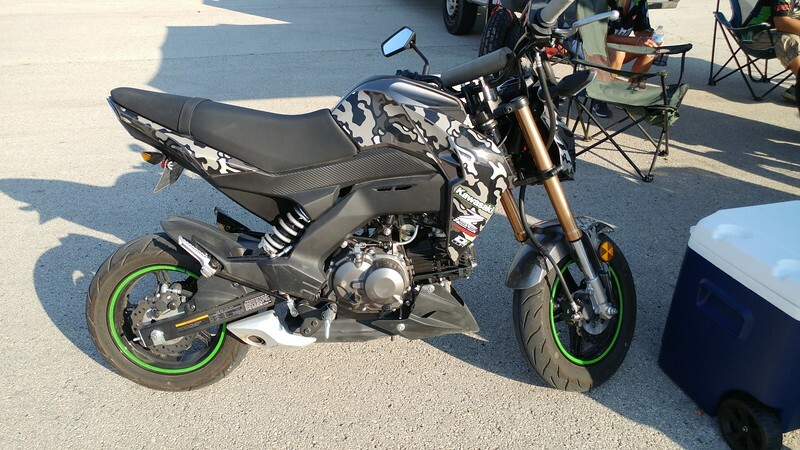 It must take a crazy person to get out there and flog these bikes like this. Right off there were a couple of names I recognized from road racing. 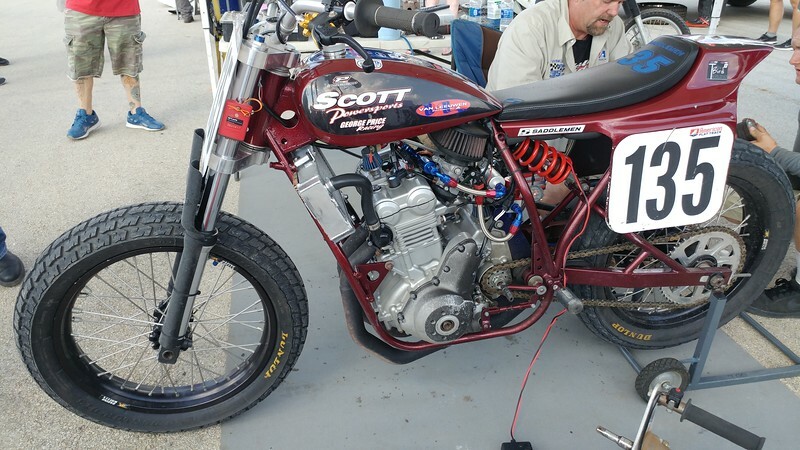 Larry Pegram stepped out of the announcers booth to fill in for injured Brad Baker on the Indian Scout FTR750. Also present was Daniel Eslick who didn't end up making the main event. 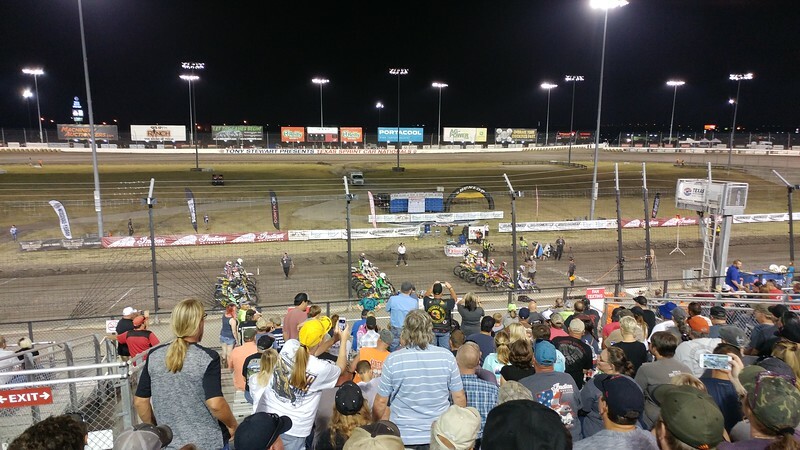 With the heat races going I have to tell you that the starts for these races are insane. Instead of a staggered start they line up like motocross racing. Elbow to elbow across the track in three lines of starters. The starts and first set of turns are interesting to spectators to say the least. During one of the heat races the rider second from the right caught a small wheelie when launching and banged bars with the guy next to him and both went down in the crowd from their line. We all jumped up in horror because the second line, also elbow to elbow had nowhere to go but over top of them. Another two riders went down and thankfully the third line was able to avoid the pileup. The red flag came out and for several tense minutes none of the riders moved. Eventually they all were able to get up and move off the track to the pits on their own power, one guy with a significant limp. A few even were able to restart the race after some off track bending of parts to get them back into shape. No pictures of the crash but an example of the start. Then came the heat race with Shayna Texter. I finally discover that she is quite the crowd favorite because the cheer that went up as she took the lead, you'd have thought she just won the main event. She led the rest of the way and it was good for a heat race. Interesting that the bikes for the main event had to be pushed out. If you are good enough to have a mechanic they push the bikes out for you. If you are a low level privateer you push your own bike in full gear so you can be out of breath before the race even starts. Finally time for the main events. The 450 race was the more exciting of the two. The lead 750 twins took off leaving the interesting racing behind them with the top three well separated. I was watching the battles further back when the leaders caught up to the lap traffic and it got hard to follow the leaders of the race with them all around the track. The results were far more interesting than the actual racing though. 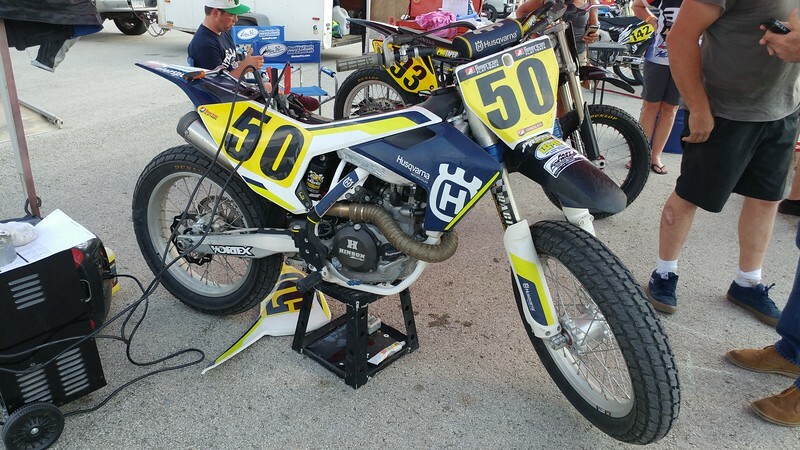 The race was won by a privateer Jeffrey Carver beating the factory HD team as well as the giant Indian factory team. 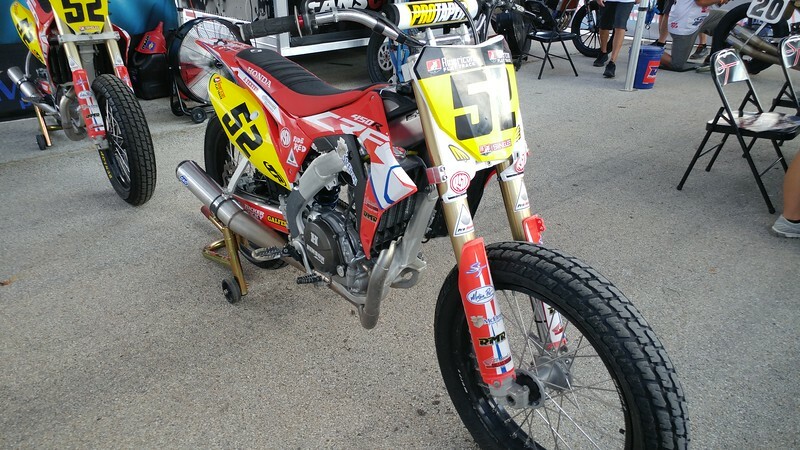 Jared Mees had been crowned champion via points at a previous race and still came in second place. Third place went to privateer Johnny Lewis. His bike was supplied to him earlier that day for the first time in practice and had been on the showroom floor earlier that week. 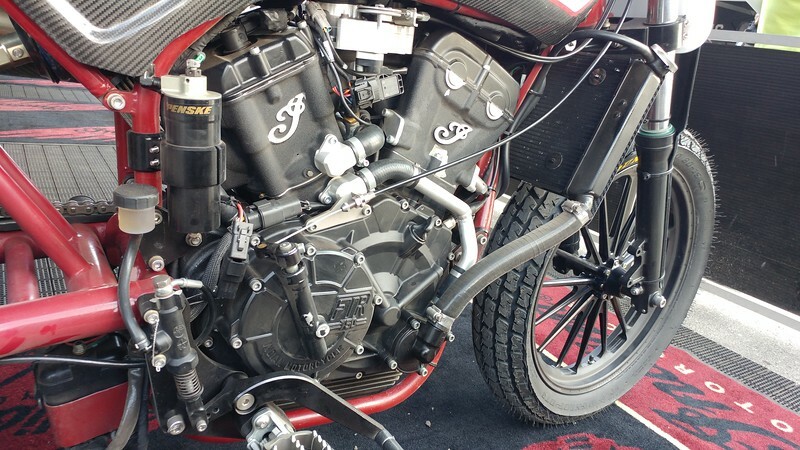 Not bad to put together a bike to beat most of the factory big boys in such a short time. The race to watch though was the 450 singles. 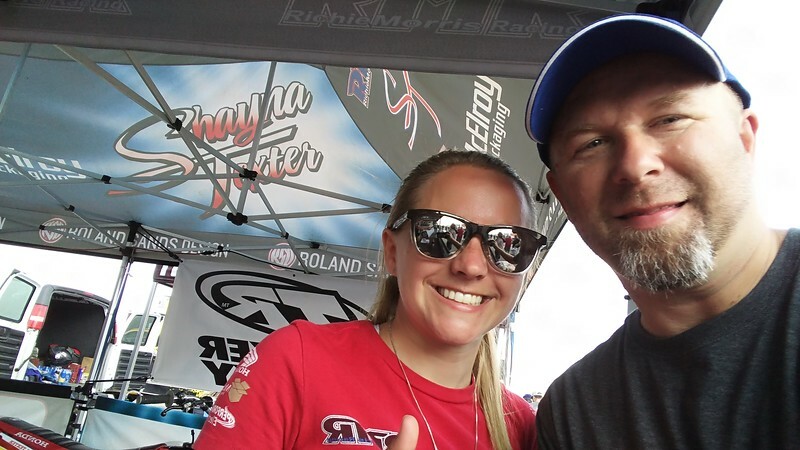 I knew by now the crowd would be pulling for Shayna and the race did not dissapoint. She started the race third in championship points and a win from championship leader Kolby Carlile would secure his spot in first place, but he'd have to fight for every point. The whole race was a battle of passes and repasses, and side by side racing as Shayna wouldn't give an inch. Eventually she pulled off the win to a huge response from the crowd and she moved into second place in the championship points race. She needs to win the last race and Kolby to pull off a 17th place to move into first so second is likely where she's going to finish. I had a good time and thankfully the bikes aren't really all that loud so next year I'll likely be bringing my son along for the fun. 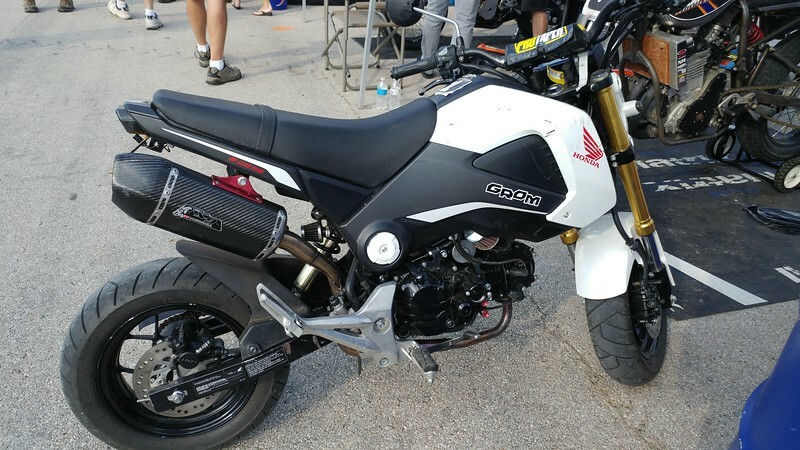 After that all that was left was to navigate the traffic on my FJR out of the track and then deal with the craziness of a Saturday night ride across the metroplex. I'm sure that maybe some of those crazy flat track bucking bronco riding racers think I'm the crazy one.